To celebrate World FM Day 2018 today (16 May), we have conducted some research around the biggest issues facing FMs. Every year The British Institute of Facilities Management (BIFM), celebrates World FM Day to highlight how facilities management plays an integral role in positive customer, client and employee experience. This year theme is ‘Enabling Positive Experiences’, which is very fitting for us at High Access as it’s what we seek to do for FMs 24/7/365. As an FM, you are always spinning a number of plates but when you have high-rise property to manage, a number of additional plates are added. At High Access, we’re here to provide support and on the all-important issue of safety. Whether it’s keeping our own people safe, or the people in and around your properties, we have a culture of on-going Health and Safety training for all our teams. In fact, we’re so committed to safety, many of our services include testing and assessment to help you run your own property more safely. For more information on our safety credentials, please click here. In our experience cracks and blockages are the two most common issues to plague gutters. Both threaten costly issues if not dealt with properly and immediately. We recommend a bi-annual clean and assessment of gutters to prevent leaks and damp patches developing during the changing seasons to catch any issues before they cause you any real headaches. The exterior of a building can cause real headaches for FMs. With hard to reach places and increasingly ambitious architecture, ensure building facades are well maintained and healthy is a huge task. 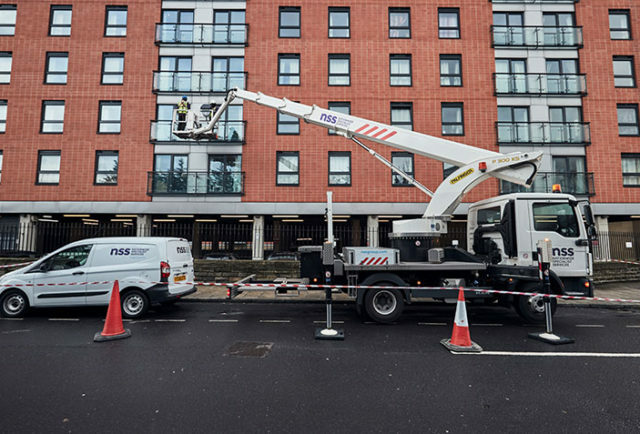 Unlike many of our competitors, at High Access we can call on everything we need in-house, minimising the need for sub-contractors or hire equipment, meaning FMs can count on consistent workmanship and a rapid response. Plus, we have a comprehensive fleet of vehicles on standby enabling us to provide a solution at any problem. Clients can rely on us to provide everything they need for any job under one roof. Thanks to all our clients and contacts who took part in our survey and happy World FM Day!